Mars scientists are wrestling with a problem. Ample evidence says ancient Mars was sometimes wet, with water flowing and pooling on the planet's surface. Yet, the ancient sun was about one-third less warm and climate modelers struggle to produce scenarios that get the surface of Mars warm enough for keeping water unfrozen. A leading theory is to have a thicker carbon-dioxide atmosphere forming a greenhouse-gas blanket, helping to warm the surface of ancient Mars. However, according to a new analysis of data from NASA's Mars rover Curiosity, Mars had far too little carbon dioxide about 3.5 billion years ago to provide enough greenhouse-effect warming to thaw water ice. 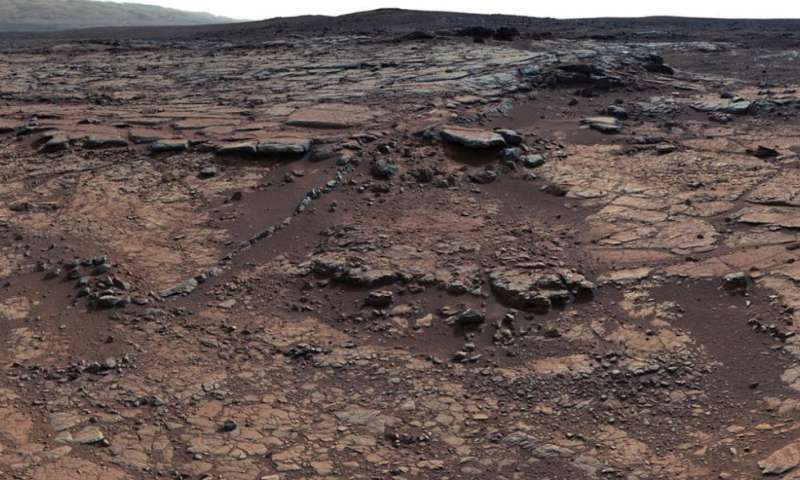 The same Martian bedrock in which Curiosity found sediments from an ancient lake where microbes could have thrived is the source of the evidence adding to the quandary about how such a lake could have existed. Curiosity detected no carbonate minerals in the samples of the bedrock it analyzed. The new analysis concludes that the dearth of carbonates in that bedrock means Mars' atmosphere when the lake existed—about 3.5 billion years ago—could not have held much carbon dioxide. "We've been particularly struck with the absence of carbonate minerals in sedimentary rock the rover has examined," said Thomas Bristow of NASA's Ames Research Center, Moffett Field, California. "It would be really hard to get liquid water even if there were a hundred times more carbon dioxide in the atmosphere than what the mineral evidence in the rock tells us." Bristow is the principal investigator for the Chemistry and Mineralogy (CheMin) instrument on Curiosity and lead author of the study being published this week in the Proceedings of the National Academy of Science. Curiosity has made no definitive detection of carbonates in any lakebed rocks sampled since it landed in Gale Crater in 2011. CheMin can identify carbonate if it makes up just a few percent of the rock. The new analysis by Bristow and 13 co-authors calculates the maximum amount of carbon dioxide that could have been present, consistent with that dearth of carbonate. In water, carbon dioxide combines with positively charged ions such as magnesium and ferrous iron to form carbonate minerals. Other minerals in the same rocks indicate those ions were readily available. The other minerals, such as magnetite and clay minerals, also provide evidence that subsequent conditions never became so acidic that carbonates would have dissolved away, as they can in acidic groundwater. The dilemma has been building for years: Evidence about factors that affect surface temperatures—mainly the energy received from the young sun and the blanketing provided by the planet's atmosphere—adds up to a mismatch with widespread evidence for river networks and lakes on ancient Mars. Clues such as isotope ratios in today's Martian atmosphere indicate the planet once held a much denser atmosphere than it does now. Yet theoretical models of the ancient Martian climate struggle to produce conditions that would allow liquid water on the Martian surface for many millions of years. One successful model proposes a thick carbon-dioxide atmosphere that also contains molecular hydrogen. How such an atmosphere would be generated and sustained, however, is controversial. The new study pins the puzzle to a particular place and time, with an on-the-ground check for carbonates in exactly the same sediments that hold the record of a lake about a billion years after the planet formed. For the past two decades, researchers have used spectrometers on Mars orbiters to search for carbonate that could have resulted from an early era of more abundant carbon dioxide. They have found far less than anticipated. "It's been a mystery why there hasn't been much carbonate seen from orbit," Bristow said. "You could get out of the quandary by saying the carbonates may still be there, but we just can't see them from orbit because they're covered by dust, or buried, or we're not looking in the right place. The Curiosity results bring the paradox to a focus. This is the first time we've checked for carbonates on the ground in a rock we know formed from sediments deposited under water." The new analysis concludes that no more than a few tens of millibars of carbon dioxide could have been present when the lake existed, or it would have produced enough carbonate for Curiosity's CheMin to detect it. A millibar is one one-thousandth of sea-level air pressure on Earth. The current atmosphere of Mars is less than 10 millibars and about 95 percent carbon dioxide. "This analysis fits with many theoretical studies that the surface of Mars, even that long ago, was not warm enough for water to be liquid," said Robert Haberle, a Mars-climate scientist at NASA Ames and a co-author of the paper. "It's really a puzzle to me." Researchers are evaluating multiple ideas for how to reconcile the dilemma. "Some think perhaps the lake wasn't an open body of liquid water. Maybe it was liquid covered with ice," Haberle said. "You could still get some sediments through to accumulate in the lakebed if the ice weren't too thick." A drawback to that explanation is that the rover team has sought and not found in Gale Crater evidence that would be expected from ice-covered lakes, such as large and deep cracks called ice wedges, or "dropstones," which become embedded in soft lakebed sediments when they penetrate thinning ice. If the lakes were not frozen, the puzzle is made more challenging by the new analysis of what the lack of a carbonate detection by Curiosity implies about the ancient Martian atmosphere. "Curiosity's traverse through streambeds, deltas, and hundreds of vertical feet of mud deposited in ancient lakes calls out for a vigorous hydrological system supplying the water and sediment to create the rocks we're finding," said Curiosity Project Scientist Ashwin Vasavada of NASA's Jet Propulsion Laboratory, Pasadena, California. "Carbon dioxide, mixed with other gases like hydrogen, has been the leading candidate for the warming influence needed for such a system. This surprising result would seem to take it out of the running." When two lines of scientific evidence appear irreconcilable, the scene may be set for an advance in understanding why they are not. The Curiosity mission is continuing to investigate ancient environmental conditions on Mars. I think that NASA has overfocused on water. The evidence from Titan and other places in the solar system means that, instead of looking for how water was liquid, they need to look at other possibilities. Some are more extreme than others. Methane mixed with water would tend to form clathrates, so that mixture is unlikely. Methane by itself or mixed with ethane works fine for colder planets. I don't know what the Martian temperature range would be if people stopped trying to fit it to Earth's environment. A major argument for methane should be Mars' current atmosphere. Take CH4 and H2O, remove the hydrogen, and you get CO2. Also if Mars had a reducing atmosphere, carbon would not be in carbonates. .....but some sort of catastrophic cause should be placed onto the table. Ohhh, it has. It is almost certainly related to the enormous Tharsis bulge, to the west, which is home to some of the solar systems biggest volcanoes. Whatever happened wouldn't have been fun. Luckily, Mars is uninhabited. Mindless adherence to assumptions will produce contradictions. And mindless parroting of Velikovskian woo has nothing whatever to do with science. So take it to a woo forum. You know the way. We know that subsurface oceans can heat and erupt from bodies such as Enceladus.. Maybe they eventually are depleted into space after flowing across the surface and pooling in low areas. The source of the internal heat need not be gravitational tides from other nearby planetary bodies. Where there has been vulcanism. there has been internal heat. these great observers keep scratching their heads! Perhaps the atmosphere contained a large enough concentration of methane to create a greenhouse-effect. We will know when we find the source of the methane emissions we're still detecting today. The simpler option is that water had nothing at all to do with the present condition of the Martian surface. 2) More scientific fail. Read up on tidal heating. And then take some science lessons. Plenty of good online courses. I suppose you're going to tell us that sedimentary rocks are formed by electric woo? And all that subsurface ice, plus the stuff at the poles that would cover Mars in 6m of water, is just a figment of the imagination? ^^^^^ Yet another pile of irrelevant prose. You're very good at that. Very light on science though. Which is what is being discussed here. In fact, you could say that pretty much sums up EU & Velikovskianism, which are pretty much the same things. So, pray tell, what has any of that irrelevant prose got to do with Valles Marineris almost certainly being associated with the Tharsis bulge? Nowt that I can see. I suppose, knowing your nutty belief system, that it'll involve Venus hurtling around the solar system, a couple of weeks ago last Tuesday, yes? If so, as I said, that belongs on a woo forum. Realize that if you try so hard to play dumb each time you discover something new, eventually you actually will BECOME dumb. Lol. Says a woo merchant who doesn't believe in evidence based science! Know how old that canyon system is, based on impact cratering? ~3.5 Ga. It wasn't two weeks ago last Tuesday, despite what the loon Velikovsky (and you) might believe. Why is it needed to increase CO2 or methane to account for liquid water. Such gases are necessary to cool other gases and to establish a lapse rate in an atmosphere which have been heated by conduction and convection. Gases such as N2, O2, and Ar do not radiate well in the infrared. So such atmospheres require greenhouse gases to radiate most of their energy away. It cannot be done just by surface radiation when there is a thick enough atmosphere. ^^^^Not sure what you're saying there? Greenhouse gases are transparent to incoming visible light. That light heats the ground, which radiates it back towards space in IR. Greenhouse gases are not transparent to IR, and therefore trap that heat. Without GG, Earth would currently be ~ -18C. As the Sun was fainter 4.5 Ga, then you need more GG, particularly on Mars. The paradox is that it doesn't appear to be CO2. So why the liquid water? Obviously something else going on. Greenhouse gases absorb certain wavelengths of sun light. The sun is not without infrared wavelengths. The atmosphere is not just heated by CO2 absorbing IR. It is heated by conduction with the hotter earth and water. Large amounts of heat are captured with respect to the heat capacities of land and water. The CO2 can absorb energy and emit it or can gain translational, vibrational, or rotational energy and transfer it to non-greenhouse gases which do much of their radiation in the microwave and radio spectra. If Mars had a lot of water and an atmosphere that was capable of having a high humidity from evaporation, then that could be the greenhouse gas that could help warm the Martian atmosphere since H2O is a much better absorber of IR and would still evaporate with a fainter sun. It should be possible to have greenhouse atmosphere with water vapor and little or no CO2. ^^^^^Agreed. H2O looks like the best candidate, if CO2 is ruled out as a major player. I've been trying to find a source for the ratio of H2O/ CO2 in volcanic outgassing. I'm not sure Earthly values apply on Mars though, as at least some of the Earth's volcanic H2O will have been from oceanic crust being subducted. Mars is obviously hot spot volcanism, and it would depend on its initial water budget. There's a recent story on here about H2O being produced from silica in the mantle, so that might have applied on Mars. I don't think CH4 can do it, as the lifetime is too short, unless there is an absolute shed load of it coming from somewhere to replenish it. It would most likely be a thicker atmosphere and a much higher percent of H2O as mentioned above. If Mars was volcanically active with vast amounts of water trapped in the subducted rocks, the released water vapor would artificially raise the greenhouse effect enough to account for the observations. I know that tectonic activity ceased early on, but it still could have allowed enough water to be trapped under the now locked plates to out-gas for hundreds of millions of years. Is it possible that long ago Mars was larger and had more gravity than it does now? Could it have suffered a huge impact that reduced it's size? If so, could the larger version have had an atmosphere as well as water on the surface that could account for the current mysteries? Just asking !!! Or maybe the planet is currently in equilibrium. in the past a catastrophic event occurred that brought it out of equilibrium by putting large amounts of greenhouse gasses into the air. This sustained for some time, but slowly moved back to an equilibrium state like today. Yet more evidence that CO2 is not that important in its role as a gaseous temporary dipole molecule. Once Mars' internal heat engine cooled off to cease volcanism and the magnetic field weakened, the atmosphere of vapor and other gases was blown away one solar storm at a time.